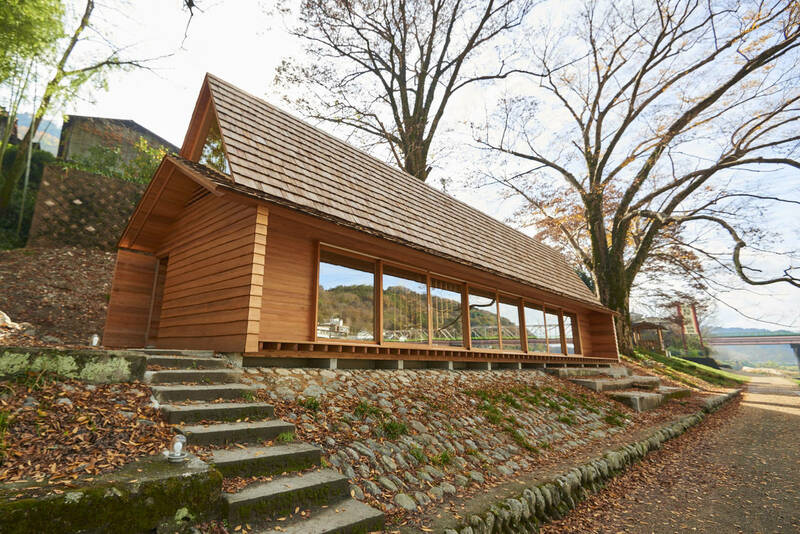 The Yoshino Cedar House is a beautiful locally crafted timber house on the banks of the Yoshino River in Japan and is the first of a kind project that explores how sharing, architecture and culture can revitalize rural communities. Yoshino Cedar House is a collaboration between Tokyo-based architect Go Hasegawa, Airbnb and the community of Yoshino. The house is built from sustainable cedar forests located in mountains nearby and was built by local master carpenters and craftsmen. The house is a hybrid community space and homestay, designed to be a shared experience for guests and local residents alike. Visitors can book the home through Airbnb and stay with one of the many local hosts, in addition to other travelling guests. Local groups use the communal space for meetings and neighbours often join visitors for meals at the long table, which is the heart of the shared living space. The Sunrise room faces east and you get lovely views of the Yoshino River and the joy of morning light. It is designed to fit up to three people. The Sunset room faces west and you get to enjoy the warm glow of the evening sun and views out over the Yoshino River as well. It is slightly larger and can fit up to four people. The communal space downstairs is anchored by a large, 15-foot long cedar table. Relax with a drink or a book and watch the Yoshino river stream by. There is a small kitchen in the space as well if you want to try prepare your own meals. One of the hosts, a local mother, comes in each morning to cook you a lovely local-style breakfast. Toasts, eggs, salads, yoghurt and coffee are just some of the options. The sushi place next door will make you a great selection of fish caught in the river and wrapped in persimmon leaves. Hire a bicycle and explore this charming old timber milling town. Stop off at the local chopstick factory where you can learn make your own cedar chopsticks. Yoshino Cedar House is located on the bank of the Yoshino River, in a beautiful valley and flowing river. It used to be the site of an old timber-inspection office - logs would be floated downstream, stop in front of the building to be checked, before making their way to Osaka. In the area, there are about 40 wood mills and other wood related factories that are home to renowned high-quality timber. Read more about the town. The town is located about an hour outside of Osaka and can easily be reached by train or car from either Osaka or Kyoto. For more information, read this helpful guide provided by the hosts.